Chefs Mary Sue and Susan are two of Chefs Collaborative’s founding Members. Our founders acknowledged their leadership in the celebration of food, and they recognized the impact of food choices on our collective personal health, on the vitality of cultures and on the integrity of the global environment. 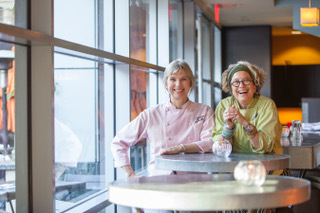 This year, Mary Sue and Susan were the first ever team to receive the Julia Child Award. We were two of perhaps 20 chefs invited to the Chefs Collaborative founding meeting in Hawaii; the goals we hammered out there are more relevant today than we could have imagined. The most powerful action item was committing to use our collective buying power to sway the food market – not just the 20 of us, but all the people that we were recruiting to be part of this exciting, new organization. We came back to LA inspired to look deeply into our purchasing practices at CITY Restaurant and Border Grill, and have been evolving our strategies ever since. All of our restaurants have environmental sustainability woven into their culture with servers, dishwashers, cooks and guests each playing a part. Now, 25 years later, the Collaborative has inspired a huge increase in consumer demand – and availability – for healthy food grown with respect for the earth. Chefs are now one of the most important voices calling the world to action. To continue driving the consumer demand underpinning this movement, we need both focused local projects that change individual lives as well as sweeping national and international efforts to press for government action that can finally and truly heal the world’s food system. On the local level here in Los Angeles, we are part of the spring 2019 launch of a commercial kitchen at the new intergenerational Los Angeles LGBT Center campus where over 100 homeless youths will live. We plan to train a staff – made up of those kids – to cook, understand nutrition, sustainability and, ultimately, move on to work in professional kitchens. On the national level, we have joined other chefs seeking to redefine how our restaurants are viewed and valued. By opening our books and records to the Good Food 100 Restaurants™ each year we can measure and compare our purchasing practices to like-minded entrepreneurs. We invite Chefs Collaborative Members to amplify this shared message by joining us in supporting Chefs Manifesto. What if each time we submit a recipe, donate to a fundraiser, show up at an event or talk at a school, we model these shared goals? We will remind our audiences of the critical role our food system plays in our future and propel the good food movement forward for another 25 years.